Enjoy a show car shine all the time! Poorboys Black Hole Show Glaze is formulated exclusively for dark colored vehicles. The glaze cleans and fills light swirl marks to leave a brilliant, glossy, slick show car shine. Poorboys Black Hole Show Glaze can be applied any time to hide minor imperfections and to enhance gloss on black, red, and all dark vehicles. Poorboys Black Hole Show Glaze for Dark Vehicles makes it easy to maintain a show car shine, even on daily drivers. You know how tough it is to detail as often as you’d like. You can’t get out the polisher for every new swirl. Poorboys Black Hole Show Glaze for Dark Vehicles allows you to hide minor imperfections on dark vehicles until you can remove them. 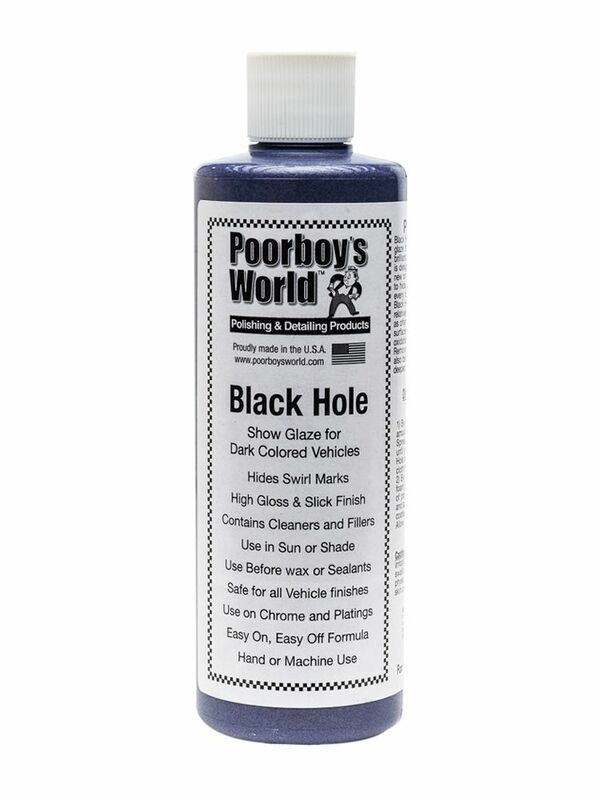 In addition to disguising blemishes, Poorboys Black Hole Show Glaze for Dark Vehicles cleans the paint. Swirls can be more noticeable when they’re filled with grime, so this special formula lifts out dirt and then fills in swirls with glaze. In just one quick step, your vehicle will be swirl-free, incredibly glossy, and slick!